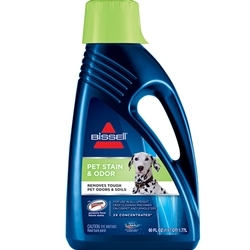 BISSELL 2X® Pet Stain & Odor formula is designed to loosen and remove the stains and soils that your pet leaves behind. Since it contains odor control technology, the formula will remove odors and help prevent your pet from going back and soiling the same area again. In addition, it will help neutralize general pet odors so that your home feels and smells fresh.